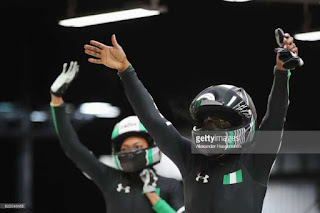 Sports Rendezvous: 2018 Winter Olympics: How Nigeria's women's Bobsled team missed out on medals. 2018 Winter Olympics: How Nigeria's women's Bobsled team missed out on medals. Nigeria's women's Bobsled team ended their 2018 Winter Olympics without a medal. The Nigerian Bobsled women on Wednesday, February 21 raced an average time of 78.58s second in Women’s Heat 3 and 4 to miss out on the medals at the 2018 Winter Olympics.